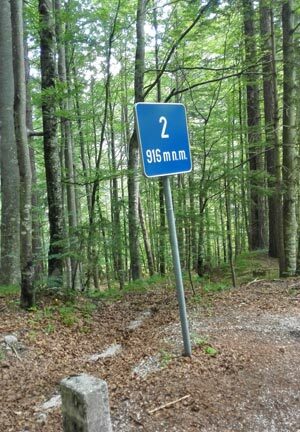 If you want to put your cycling abilities to test you should definitely try climbing Vršič Pass, the highest paved mountain pass in Slovenia. 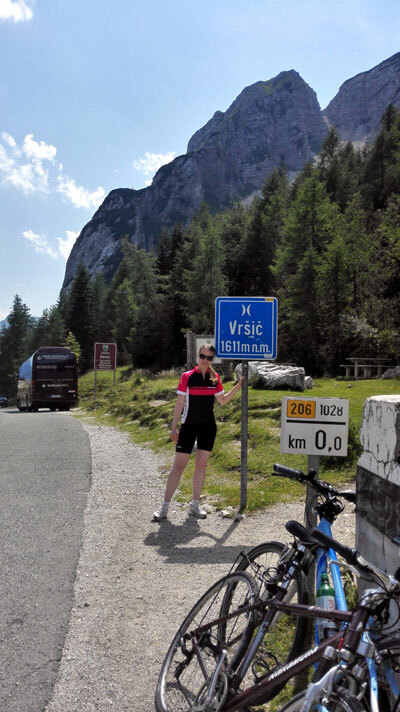 The Vrsic Pass ascent is something that every cyclist should try at least once in their lifetime, they say in Slovenia.. It’s something that I wanted to do for a long time and this summer I finally did it after getting my fitness to a level I was happy with. Imagine climbing constantly for 11km? That’s exactly what I did! Not an easy climb, but what a sense of achievement once you are on top.. 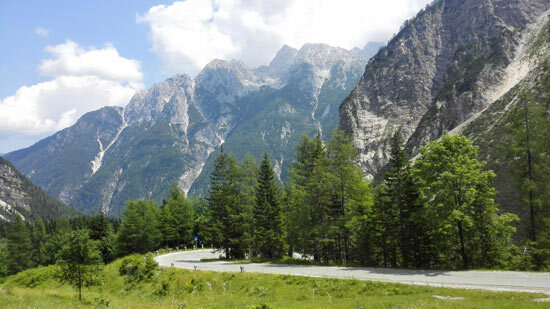 There are two sides you can start your climb from – one is from Trenta valley, which is the hardest, and the other one is from Kranjska Gora village, slightly easier, not as steep, but still challenging. 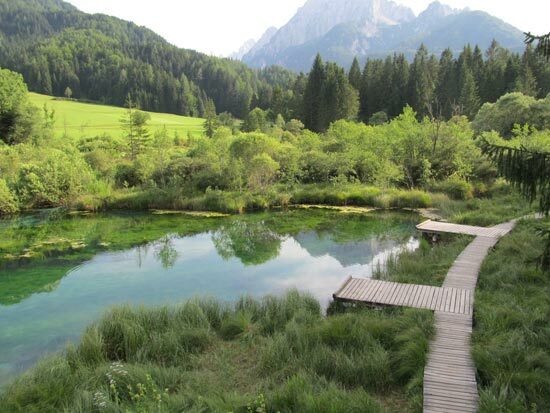 We actually stayed in Kranjska Gora for 4 days, after spending a few days in Bled, not far from Kranjska Gora (I previously wrote about it here). 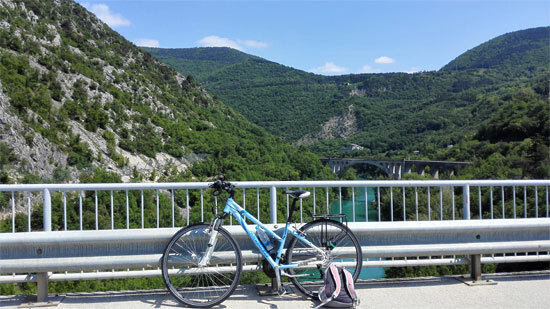 Me and my boyfriend did quite a bit of cycling around Bled and we also cycled from Bled to Kranjska Gora (about 30km I think), so I wanted to have a bit of break from cycling, just to get my muscles ready for the challenging Vrsic Pass climb. We didn’t cycle for 2 days, but the day before our big cycling challenge we went hiking to see the Martuljek waterfalls. I thought this would be a nice break from cycling, but actually hiking was pretty demanding and it included some climbing as well so I wasn’t feeling exactly rested the following day. In the morning my knees felt uncomfortable, joints slightly aching. My knees not being able to cope with all the activities was my biggest concern actually, and after experiencing discomfort in the morning I thought that maybe I won’t be able to do it (my damaged cartilage does have some limits at the end of the day although most of the time it doesn’t give me any problems). No matter what, I was still determined to give it a try and see how I get on. After packing enough water and energy snacks we started our challenge. From Kranjska Gora we cycled past Hotel Lek and this is where I checked the time. It was 11.49am, if I remember right. Here is the point to start timing your ascent to see how long it will take to the top. 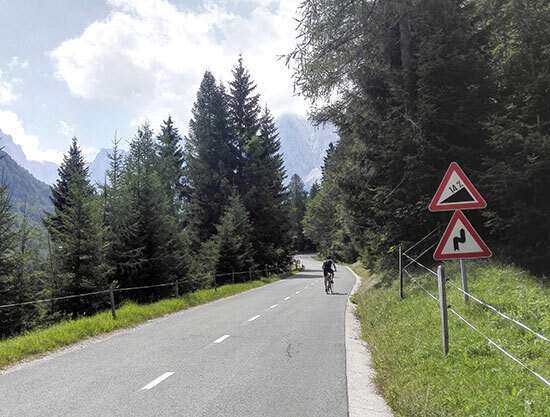 Past Hotel Lek, the road leads us slightly uphill, passing Jasna lake and from there we continue straight ahead, eventually welcomed by a sign showing a 14% incline. From this sign road gradually begins to climb up and the bends become steeper and more frequent. Every bend is marked with a blue sign where you can see its number and the height above the sea level. Cycling to the top wasn’t a race, we took it really easy, stopping several times – first stop was actually very soon – nature calling, my boyfriend of course :-). I actually didn’t need a break at that time but still had to wait for him. On reaching first mountain hut by the road after quite steep hill, it was my turn – I needed to use ladies.. At this stop we also had some fruits for a quick energy burst. The climbing continued and it was constant, with no flat areas. It was pretty hot too, around 30 degrees I believe, so my mouth was getting dry really quick and I was stopping often to drink water. We also stopped to admire spectacular scenery around us and take pictures. When we reached the bend number 10, I started to feel tiredness in my legs, wondering whether my legs will be able to take me to the top. Constant climbing was tiring us of course and many times I wanted to change the gear to a lower one only to realise that I was already cycling in the lowest gear possible! Luckily my bike had 24 gears, giving me slightly more options, but my boyfriend’s bike had only 18 gears and he couldn’t even change to the lowest gear as it wasn’t working so he was worse off and this resulted in him being slower than me and me waiting for him on almost every corner! He also needed to stop more often to get a rest. Not far away from the top, I got fed up and just left him behind, reaching the top first. Just to mention it wasn’t always his fault for the delay, we actually encountered a herd of cows on the road, blocking it totally so we waited for them to move first before continuing. The last bend was one of the most difficult ones. It was steeper comparing to others and longer so it was really testing my fitness levels. I didn’t give up of course. The whole route I didn’t walk and never stopped in the middle of the hill because I couldn’t continue – I just pushed myself and pushed myself throughout the whole climb, until I was finally on top. My boyfriend managed to reach the top probably around 10 minutes after I arrived. In total it took us almost 2 hours to get on top – we were there at around 2pm. This included all the stopping we did but if I was to include only the cycling we did, it will probably be around 1 hour or slightly more of only cycling. 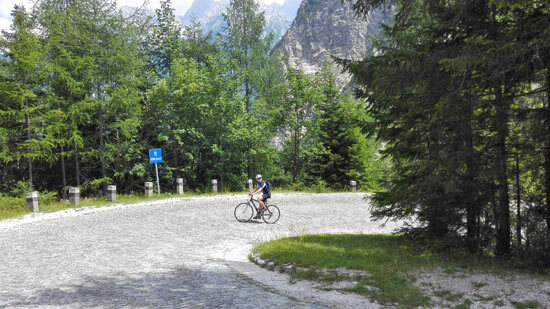 We started in Kranjska Gora on 800m above sea level and we cycled 12km to reach the Vrsic Pass. Over this distance, we climbed 811 metres. What an achievement that was for me, really happy and proud of myself considering that last year I couldn’t do much cycling because of knee problems. We stayed on top for about an hour, resting and having some nice home made food. The descent was really quick, taking us something like 10, 15 minutes and after this we cycled to Italy to check some beautiful lakes on the other side of the border. What’s your biggest cycling, running or hiking achievement? Do you have any fitness goals that you are working towards? Thanks Gem! Don’t worry, everybody has their own strength and weaknesses. Haha, I like your #girlpower, it’s a shame he didn’t have a bike as good as mine to keep up with me..
Slovenia is great for hiking and cycling and to do it you don’t have to have a particular fitness, you just choose routes which suit your level. Good luck with your handstand! Wow! What an achievement! Cycling 11km up a steep hill isn’t really my cup of tea, however it’s great to see you embraced the challenge and completed it. Just by looking at your photos I bet the views were even better when you’re standing at the top yourself. Wonderful! I’m looking forward to trying this in two months. I may stop more than you did. I think it may be a great place to take photos.